To ensure the the healthy and pleasant condition of your vehicle you should provide proper cleaning of its upholstery, besides its exterior. You can use our affordable services to maintain the hygienic condition of your car upholstery. Our cleaning assistants use effective machines and suitable sprays to remove spillages, stains and grime. Thanks to their experience, knowledge and professionalism you can have your car upholstery deep cleaned and refreshed. Get in touch with us to book the car upholstery cleaning which we offer in Finchley and nearby. 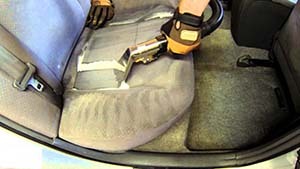 Car upholstery gets easily soiled and needs regular sanitising. By using our professional cleaning services you will make it rid of the smears, odours, spillages and grit. Book the affordable car upholstery cleaning which we provide in and around Finchley to keep the interior of your vehicles presentable and healthy. We guarantee you excellent results of our work. Our employees hoover the upholstered surfaces, apply suitable sprays on them and use soft bristled brushes to scrub them. After that, our staff leave the cleaning product to work for some time and then use steam cleaning machines to extract the grime. The car seats, headrests, mats and other upholstered surfaces will be deodorised and ready to be used. To get your car interior back to perfectly clean condition use our professional upholstery cleaning services. Our staff work with advanced and high-quality detergents, sprays, solutions and machines. They will restore the real colours of the car seats, carpets, headrests and upholstered surfaces. Contact us over the phone, by e-mail or online to schedule your car upholstery cleaning in N3 Finchley to ensure the presentable and healthy state of your vehicle’s interior. We will do the work at a convenient for the customer time.